The tune I have could soon to be announced by one of our supporting vendors. It is still in the refinement stage. I am just a test vehicle for them. Hope it works out though I really like the "extra" power performance I am enjoying. Lots of tunes out there now! They are all pretty similar, nose diving at high RPMs, showing the need for more turbo. We are the "Supporting Vendor" and this tune is now for sale for $150. See details on our web site. We cannot program blank ECM's so you'll have to get HP Tuner's VCM Suite or find someone who has it to download your stock tune and send to us which we modify. Or drive to our shop for $25 installation. We STRONGLY recommend at least a performance air filter like the K&N drop-in or a CAI. If you choose to purchase any of Wester's tune's in the future (from us), the $150 will credit toward his products. I know it says to use HPT but if a member sends you his ECM (not a new one) will the cost be the same or will the $25.00 need to be add it to the $150.00 cost. Aggressive GXP at $25,995.00 shipping of $600, MT. Air, $960; Chrome Wheels, $545; PCQ, Premium Package (Leather), $525; Radio, 6-Disc with MP3, $495; Monsoon, $395; Premium Acoustic Headliner, $150; and Sport Metallic Pedals, $115; all totals $29,180.00. No XM/OnStar and NO Spoiler. MODS (Magnaflow 2.5", BTF Turbo Upgrade wheel,DDM BB,ProBean&tune, Vntrshield, LVKFCB, JPM. About 2 hours ago, i shipped out my new ecm to westers for his 2008 tune I hope to recieve it within the next 2 weeks. Location: Objects in mirror will soon disappear! Dejon can not tune an ECM out of a car, that is why you need the HP Tuners, Westers, and PCM4less can both read and reprogram the ECM out of the car, either one can program a blank ECM as well. Dave does this as a courtesy to all us us, the equipment required to program and ECM "on the bench" is very expensive. For $150 you need to be able to do the install yourself, or have a friend who can. Deepbluegxp, Just Mike, and I have done installs for several people. Custom Jonymac glass wind screen, one of a kind. Eclipse AVN726e; ZED Audio Leviathan, Image Dynamics tweeters, CTS door subs, active crossover tri-amped. Audio Control 6 channel 30 band parametric EQ. Attached is my best pull out of 3 (which were all close). All are rear wheel hp. Max rwhp was 311.17, Max torque 362.67. This was at 25psi. We put the stock tune in Glenn's 08GXP for a base run of 223.09rwhp and 246.69ft-lbs. So the increase is 88hp, 116ft-lbs. The tune I used was a hybrid of Wester's latest with some mods by me. 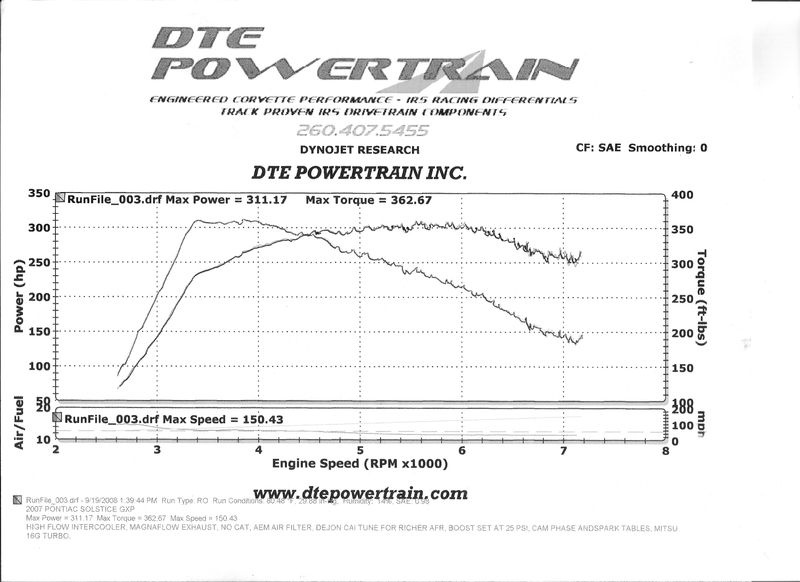 Very different power curve than the stock turbo Dave, all the HP is down low with a fairly flat torque curve. It is almost backwards to what mine is. 2008 Black/Black GXP, purchased 7/23 right off the train. Mod#2 GMPP Intake -I like to hear my turbo. Last edited by bradyb; 09-23-2008 at 07:17 AM. Nice numbers bud! I think you could be the first to hit 400wtrq with that 16G. 1.8bar is like 26+ psi. That's where your torque is coming from. Of course our little turbo can't hold it for long. dam thats nuts, qtr. i have the pcmforless tune also. i don't have an upgraded IC or intake but i do have the solo street race exhaust and a k&n air filter. i reaaaaallly want to dyno my car to see what the powerband looks like. mine feels like the power is balls to the wall from about 3000 to 4000 and then remains flatline all the way up to about 5500. your chart is pretty close to that. 389 ft lbs of torque is just plain incredible. you need to send this to bryan. amazing. that's alot of boost are you keeping track of AFR and knock ?